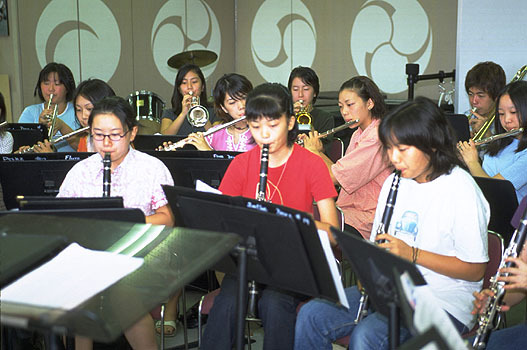 In junior high school, music was a compulsory course and we had to choose an instrument to learn. I chose the flute. I chose flute because it seemed familiar to the fife I played in the fife-and-drum corps in elementary school, but also because I wanted to change the image others had of me at that time. In those days I was always the tomboy type--always playing soccer with the boys and spending every recess outside. When I picked the flute and the rather elegant image that goes with it, my friends were really surprised. In high school I decided to take this class in wind instrument music and have gone on playing the flute. In preparation for performances at the school concerts regularly scheduled during the year and our sports festival, we are practicing "The Fairest of the Fair."